Get On Board - Train Enthusiasts ! Life is like a mountain railroad. 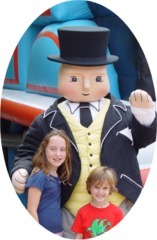 A program of multimedia presentations & displays with a train theme for the entire family. Hosted at Trinity Church in Petersburg, Va., next presentation TBA, open free to the public. Trinity Church is located at 215 South Sycamore Street in downtown historic Petersburg, Virginia. Next presentation TBA. Everyone invited. Copyright © 2001, 2009 www.curtis.anderson.name All rights reserved. Copyright © 2001, 2009 TRAIN SINGER® All rights reserved. Watch our Local Cable Channel 3 video broadcast on selected Mondays at 5:30 pm. Other recent broadcast Click Here and Click Here and Click Here. as we "strainin' ev'ry nerve. No difference in the fare"
Four Kinds of Trains Meeting the Train Singer Singing on the Train "Woo-Woo"
And your eyes upon the rail. Peanuts® LARGE 'G' Scale Train Display: Engineer Snoppy at the controls. pulling in at the Petersburg train depot. What a sight and sound to behold. Take a (video) ride on Thomas The Tank®. See Thomas and Friends®. Thomas the Tank®Gullane Entertainment,inc.,all rights reserved. Photos/Videos taken on site at Marine World Parkway, Vallejo. Ca. Copyright © 2006 Wcast.info. All rights reserved, including all video, audio, images, text, and or other digital media content. 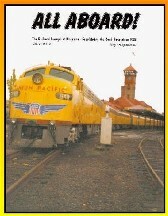 Contact the church office or email Trinity for a free copy of our ALL ABOARD Magazine. Copyright © 2006 www.wcast.info - All rights reserved. Disclaimer. .